It's been a while since the last photograph of things I've bought so this seems like a good way to pass the time until Judge End airs. The first picture includes three US Blu-ray sets: Nekomonogatari Black, Nekomonogatari White and NIS America's gorgeous Fuse: Memoirs Of A Huntress box set. The book is the Musha-e Exhibition Catalogue from the Souma Nomaoi exhibition I saw at Japan Expo on Wednesday. It's satisfyingly thick and full of modern-day interpretations of traditional mounted warriors. 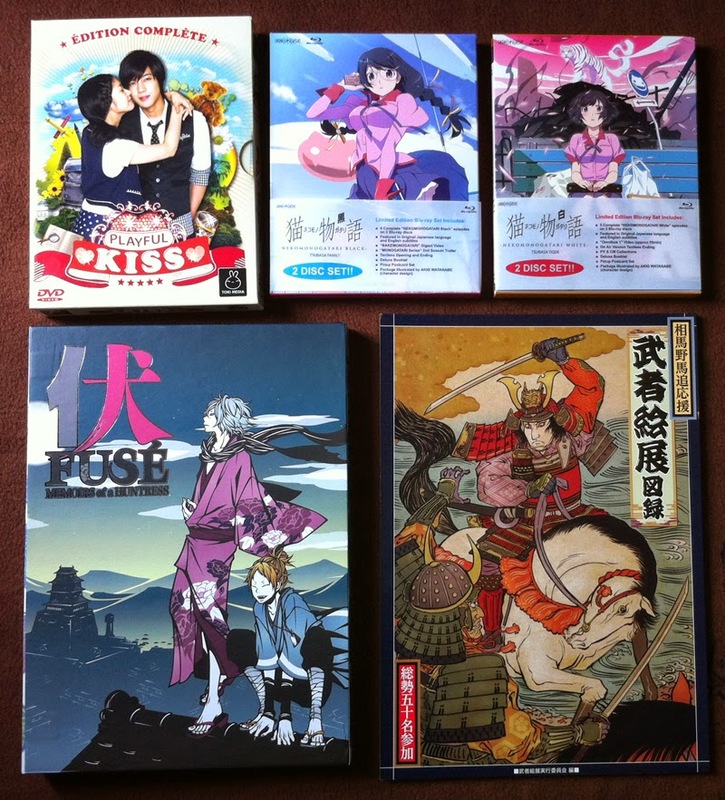 The box set in the top left is Playful Kiss, the Korean live action adaptation of the Itazura Na Kiss manga. I had absolutely no idea that a French company was releasing Korean television shows on DVD (with both English and French subtitles!) until I saw them at Japan Expo. While Toki Media only seem to have three titles in their home video catalogue right now, it would be great to see more Asian television shows released on DVD in this part of the world. Next is my most recent batch of Diabolik Lovers goodies, including the final volume of the anime (it was delayed by two months) and its bonus tokuten CD. 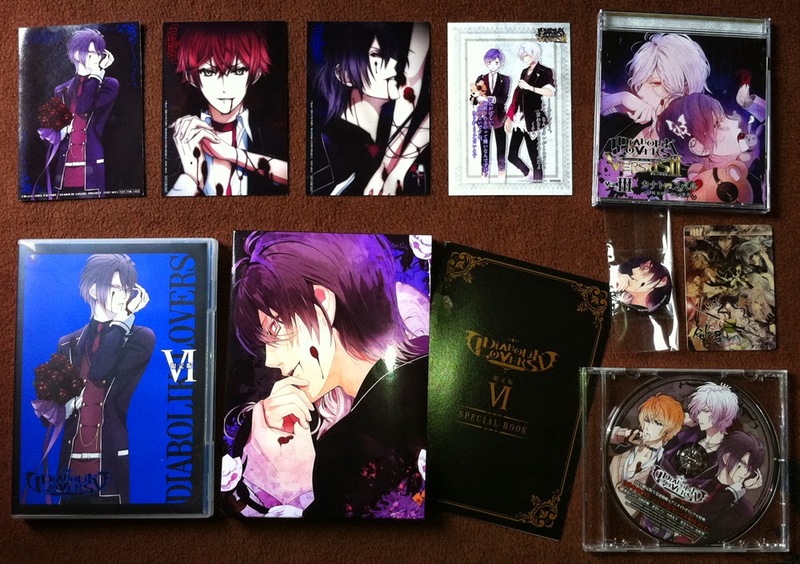 I also received the Diabolik Lovers do-S Kyuuketsu CD: VERSUS II Vol. 2. Both items came with bromides; it's hard to believe that this picture only represents the purchase of one DVD and one CD. Animate sent me a little Ken Ga Kimi card as well which is tucked away on the right side. 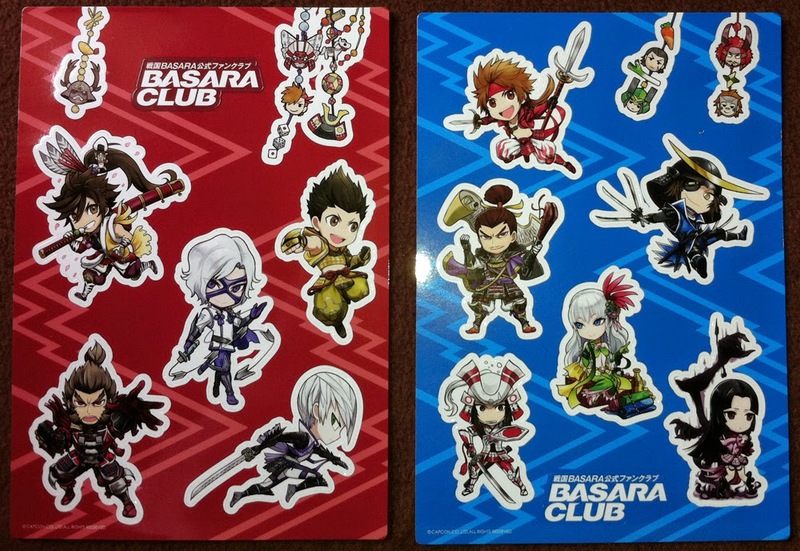 Of course, I received some Sengoku Basara items too. 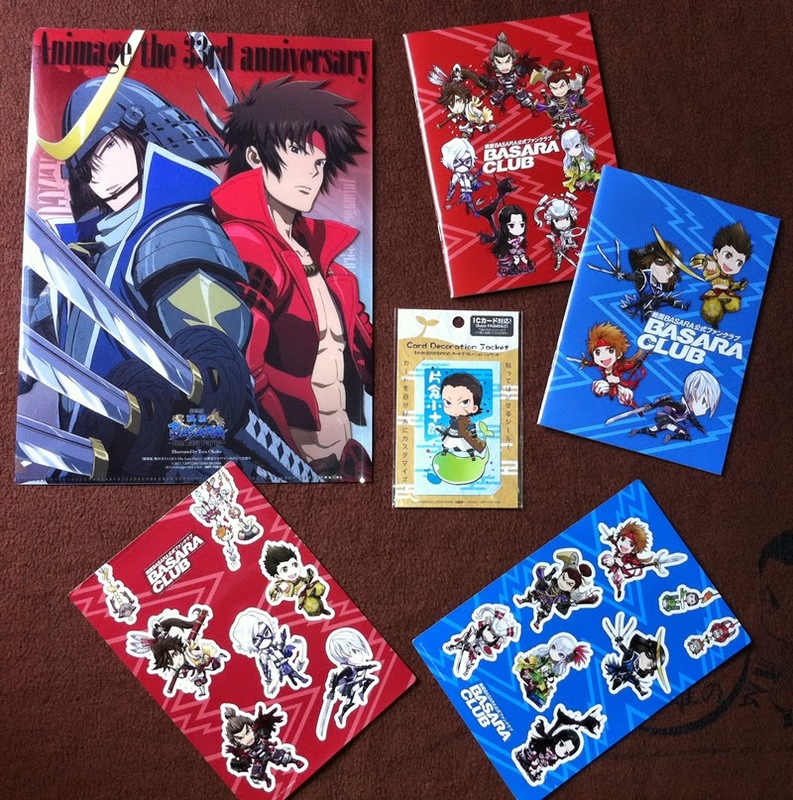 To go with some doujinshi (not pictured) and the Kojuurou IC card sticker in the centre, Otaku Republic sent me a free Sengoku Basara -The Last Party- clear file as a gift. The two items in the top right are notebooks from the official fan club shop which match the sheets of stickers at the bottom. I took a close-up picture of the stickers as the illustrations are so cute. I love Nagamasa's facial expression, and Keiji looks great too. I suppose I should start preparing for tonight's episode now!